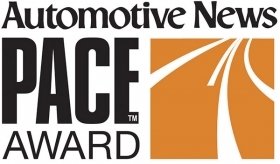 Thirty-three innovations from 27 component and technology suppliers around the world have been selected as finalists for the 2018 Automotive News PACE Awards. The winners will be announced April 9 at the Max M. and Marjorie S. Fisher Music Center in Detroit. The PACE Awards — now in their 24th year — identify supplier innovations that have entered the market and are delivering measurable customer benefits. The finalists, selected by an independent panel of judges, include new products and enhancements in autonomous drive controls, passenger comfort, electric-vehicle components, lightweight materials, display features, safety technologies and powertrain efficiency. They were drawn from an industrywide application process that is open to automotive companies around the world.